Tess has been training gundogs for the past 30 years and has run in the Championships 22 times with 11 different dogs. She has been in the awards 9 times. FTCh Willowyck Ruff was second in his first Championships in 2003 and won in 2007 at Windsor where Tess received the winners trophy from her Majesty the Queen. Tess has also represented the England team at the International and CLA Game Fair on many occasions with several different dogs. Tess has recently returned home to Wyck Rissington and takes a few dogs in for training each year. Tess judged the Championships in 2005 at the Duke of Buccleuch's Drumlanrig Estate where she now regularly picks up. 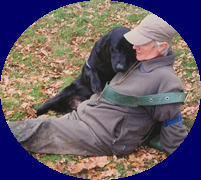 Alan has been involved with training and competing with gundogs for 40 years. He has qualified for the Retriever Championships 13 times with 6 different dogs. He was 2nd, 3rd and 4th with FTCh Shinshail Apache whom he qualified 5 times. He was 1st and 3rd with Patch's son, FTCh Tasco Dancing Brave of Willowyck. He has judged the IGL Championships 3 times and also the Irish and Danish Retriever Championships. He has reperesented the England gundog team in the European International and the CLA gamefair with FTCh Willowyck Jack Snipe.